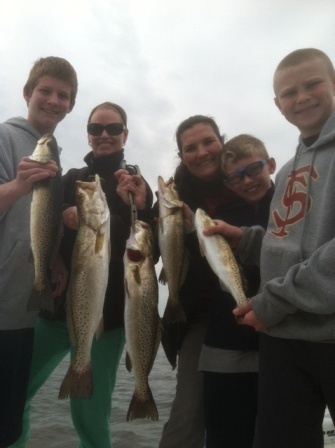 Nothing brings on more excitement and anticipation than the advent of the first catches of the Springtime Speckled Trout in the Greater Destin Inshore Bay Fishing areas. The Speckled Trout is known for its aggressive bite and ability to challenge the most seasoned anglers. 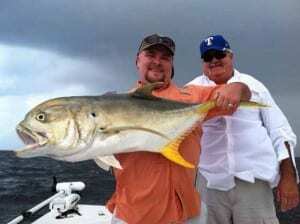 The challenge lies with attempting not only to get it to accept a bait but also land this Destin Inshore sport fish. 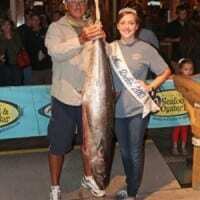 But where are these elusive Destin Inshore Fish in Springtime? Just what does it typically take to catch even the smaller ones versus the much sought after Gator-Sized Speckled Trout? To answer these questions, you must understand not only the Speckled Trout itself but also understand how the water temperature and geography of land affects its movements, what prompts these Destin Inshore Sport fish to come out of their Destin Bay hideouts, and finally, what they really want to eat once they are active in their Destin Inshore Fishing areas. The Speckled Trout is known for its aggressive nature which appeals to anglers all around the world. It has a very muscular build and is similar in size and shape to many of its freshwater cousins such as the Brown and Rainbow Trout. 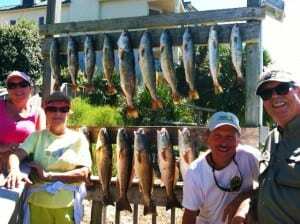 Destin Inshore Speckled Trout range in size from 10 to 32 inches in length. Speckled Trout have a distinct coloring pattern with a dark black back and shoulder area accompanied by a dominant silver body and purple hue along with their signature black dots arranged all over their bodies. They are known to return to the same shallow water grass flats within the Destin Inshore Bay in which they were spawned. The movement of Destin Inshore Speckled Trout typically coincides with water temperatures. Many tried and true Speckled Trout Anglers will tell you the magic number which signals the movement of Speckled Trout within the Destin Florida Inshore Bay area is seventy degrees. At seventy degrees a number of things happen which prompts the Speckled Trout to feed. The first factor is the deep water holes Speckled Trout favor over a cold winter are no longer able to provide the same warmth as the shallow Destin Inshore Bay Flats, which now hold heat much better and stimulate more aggression within the Speckled Trout. Water temperature is such a big factor with Speckled Trout, that it is said for every one degree of water temperature change on a Speckled Trout is like eight degrees of water temperature change on a human body. With the water temperature at its desired level, Spring time Speckled Trout will look for the areas which will consistently hold these desired water temperatures. 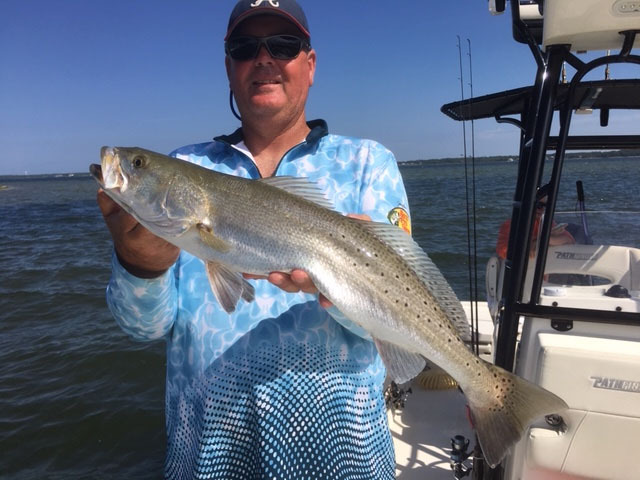 The most common areas Speckled Trout seek for consistent desirable water temperatures are dark muddy bottom bayous which can capture and hold the warmth of the sun better than most of the other Destin Inshore locations. Speckled Trout loiter along the bottom of these muddy bottom bayous in anticipation of a quick ambushed meal and then quickly return to the warmth of the muddy bayou bottom. Another desirable Springtime Destin Inshore area which holds the warmth necessary for a Destin Speckled Trout to thrive is the shallow sandy grass flats which also heat up quite quickly as the day progresses. Finding and catching Speckled Trout in these areas lends itself to some great Speckled Trout fishing even later in the day when the sun is at its highest point. Now determining what prompts Destin Inshore Springtime Speckled Trout to eat is a challenging but yet predictable proposition if you just pay a little attention to what inhabits the areas you’re likely to find Springtime Speckled Trout. One of the best ways to determine what Springtime Speckled Trout are eating is to take a look at these areas, and observe whether there are small minnows, crabs or shrimp in any sizable number in the area. In my experience some of the first baits foraged by Destin Inshore Speckled Trout are Live Shrimp. A live shrimp will inhabit Destin Inshore Bay areas all year long and is a quick and easy target for a Speckled Trout. Another great Springtime bait for Destin Inshore Speckled Trout are the small menhaden (Pogies) that typically inhabit the back bayous by the thousands and make a quick and easy meal for Destin Inshore Springtime Speckled Trout. 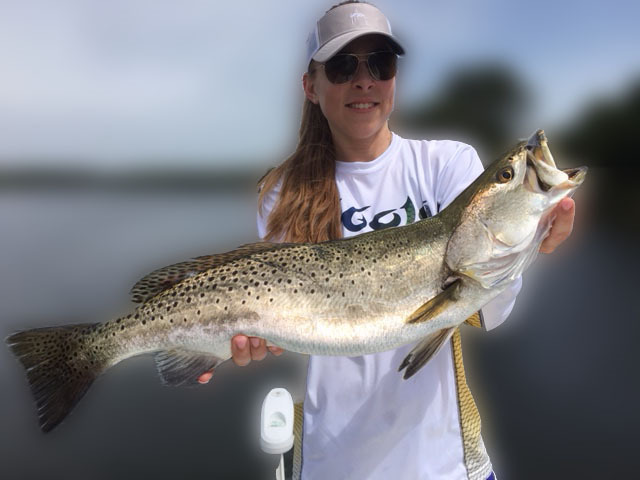 Knowing what Destin Inshore Speckled Trout are eating at any given time also allows you to mimic the live bait option with an artificial lure which represents these same live baits with great success. 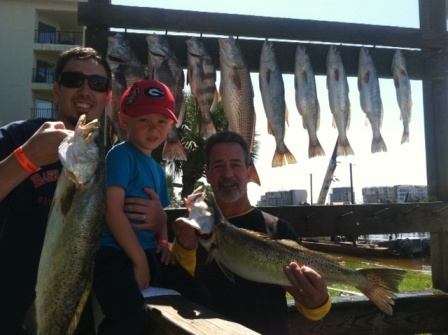 Springtime has now hit the Destin Florida Inshore Fishing area and water temperatures are within a few degrees of hitting the seventy degree magic number in which Speckled Trout flourish. Your next move should be to hit your favorite local bait shop for some live shrimp. In my case you can’t go wrong with the great folks over at The SALTY BASS BAIT & TACKLE SHOP. It is the “Hands Down Choice” for the liveliest and best maintained shrimp. 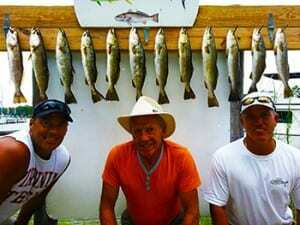 These shrimp have consistently caught me and my clients some of the best quality Speckled Trout. Until Next Time Let’s Go Catch’em Up!!! 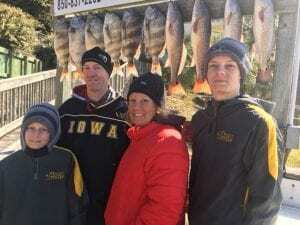 Winter Destin Inshore Fishing 2018-19 Has Arrived!!! Winter has arrived and as the seasons change, so have the fish we target and how we target them. Flounder and Sheepshead are targeted now along with some Redfish action. Nice catches of all three species have been accomplished by our Clients. With the cooler Destin Inshore water temperatures comes the signal to the Flounder to move out of the Destin Inshore Bays and out to the Destin Inshore Gulf areas. Flounder can be targeted within 200 yards and up to 3 miles off the beach. Flounder migrate in response to cooler water temperatures and also spawn during this time. 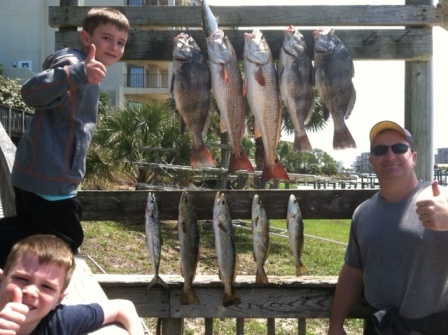 On our Destin Inshore Fishing Charters, we have an average catch of 20 Flounder. Catching Flounder is not only fun but can be quickly learned by even the most novice beginners of all ages. 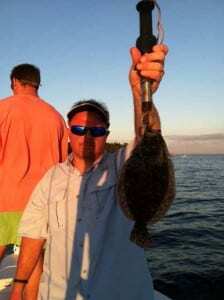 In my opinion, Flounder is one of the best tasting fish on the Destin Inshore. Flounder are great both fried or baked and can really stimulate your senses when stuffed and baked with a seafood dressing, Yummy! Another wintertime fish we target is the Sheepshead. During the colder months on the Destin Inshore, Sheepshead become more active and start eating a lot more. Sheepshead forage around bridges, pylons and jetties looking for various Destin Inshore crustaceans such as crabs, shrimp and barnacles. 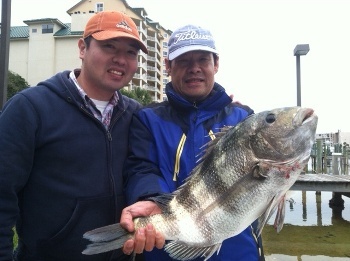 On our Destin Inshore Charters, we typically like to use live shrimp to target the Sheepshead. The Sheepshead is a clever fish at stealing your bait, which in turn requires your full attention to detect their very subtle bite. However, once you feel the bite of the Sheepshead and actually hook one, hang on because they are as feisty as they come! Last but not least is the Redfish. 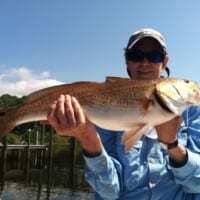 During the winter months, the Redfish inhabits the Destin Inshore Bay around docks, bridges and jetties. 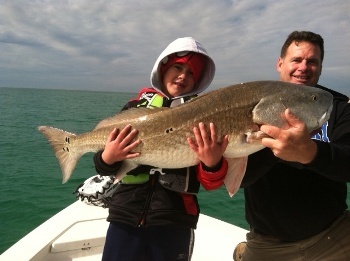 The Bull Redfish can be found cruising the Destin Inshore Gulf Beaches in larger schools of 200 or more. We typically target the Destin Inshore Bay Redfish with live shrimp in the wintertime and target the Destin Inshore Gulf Bull Reds by sight fishing them with artificial bait. 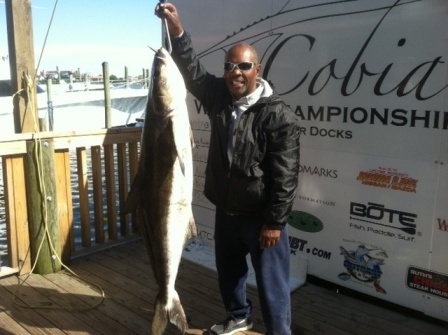 Our wintertime Destin Inshore Fishing typically starts in November and runs through March. 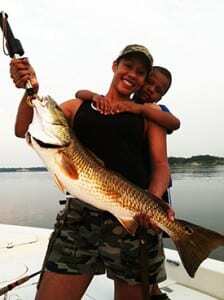 We are truly blessed we have great Inshore Fishing Opportunities year-round. Please don’t hesitate to pickup the phone and call, text or email me personally regarding the latest fishing report or if you’d like to book me or one of our highly experienced Destin Inshore Fishing Guides. John kept wanting to know if they would catch enough fish for a fish fry.. HE GOT HIS ANSWER! 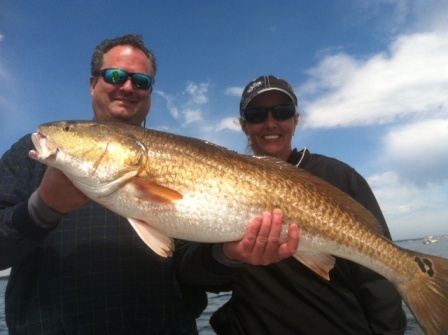 The Destin Inshore Bay and Flats fishing has arrived in a big way. 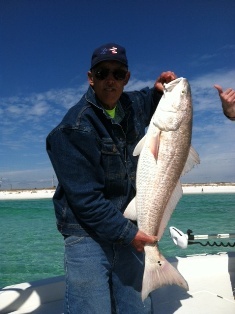 The Redfish bite has turned on really nice on the Destin Inshore Bay and Flats. 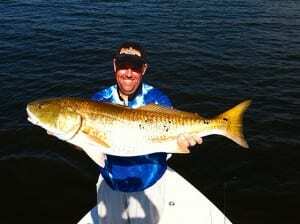 The reds are around the deeper water docks in excess of 5 feet but are also on the Destin Inshore Bay and Flats. Also if you’re seeing mullet in this same environment, it’s a sure bet that the redfish are lying underneath them. 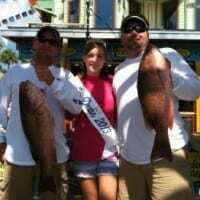 Live baits of choice for these redfish have been live shrimp, pinfish and finger mullet. 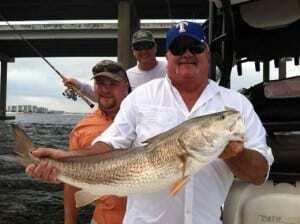 On the artificial side of things, Jerk Baits have been slaying the reds in the greater Destin Inshore Fishing area. 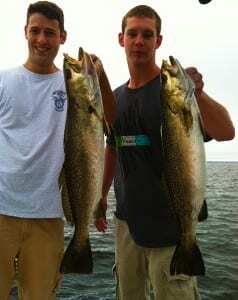 Speckled Trout have fully turned on around the Destin Inshore Bay Flats. During early spring, I prefer to throw artificial bait imitations of the surrounding fingerlings that these trout are gorging themselves on. Mirrodine’s in your favorite color seem to elicit quick strikes from these hungry trout. I’ve also caught several nice trout with Topwater lures, which happens to be my personal favorite way to catch fish on the Destin Inshore Bay and Flats. Destin Inshore fishing with topwater lures is an early morning or late evening affair. Also if you like live bait, you can’t go wrong with live shrimp, either free-lined or as my clients seem to favor, under a popping cork. Either method will get you positive results. C’Mon, Let’s Go Catch’em Up! Loading up those coolers full of fish continues to be the NORM! 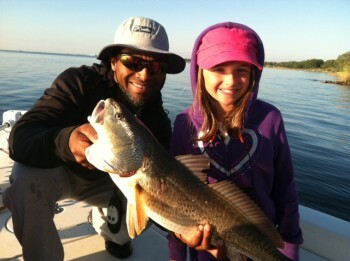 The Destin Inshore Bay Winter Fishing Is On Fire! Flounder: The Flounder bite continues to be exceptional with the cooler water temps. 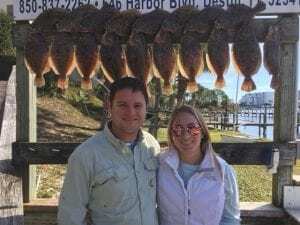 As a Destin Inshore Charter Fishing Guide, the cold fronts I look for have pushed through the Destin Inshore Bay Fishing areas, allowing my clients to target these fine eating flat fish. The cold fronts have sent the signal to the flounder and they have responded by moving out of the Destin Inshore Bay in massive numbers. This is absolutely the best time of the year, to get your limit of 10 Flounder per angler. On nearly all of my trips, we have easily caught our limits of flounder and then some. The flounder will ultimately settle in their breeding areas, where they will pose the easiest opportunity to Destin Inshore Bay fisherman to catch them throughout the winter months. Baits of choice include live finger mullet and bull minnows. My preference for rigging these live baits is either Carolina Rig with a short 8 – 10 inch leader, or a half ounce jig head directly hooked to the live offering. With the Carolina Rig, make sure to allow the flounder enough time to grab your bait and turn it around in his gullet before setting the hook. Sheepshead: The Sheepshead bite is on, and as with Destin Inshore Fishing during this time of year, and with all the cold fronts, these striped bait stealers have made their presence known at both the Mid-Bay Bridge and Destin Pass area. Baits of choice for these convict fish are live shrimp, fiddler crabs, and raw oyster. A Carolina or Texas rig will serve to help you claim your limit of 15 Sheepshead per angler. 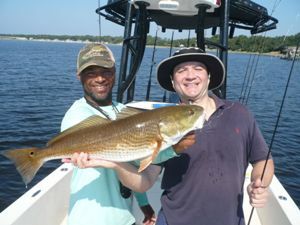 Redfish: The Reds have maintained their bite consistency throughout the Destin Inshore Bay and Pass. The Bull Red action just can’t be beat in and around Crab Island, Destin Bridge and Destin Pass on an outgoing tide. Destin Inshore Fishing for Bull Reds this time of year means you must be prepared to take on Bull Redfish in the 10 – 40 pound range. 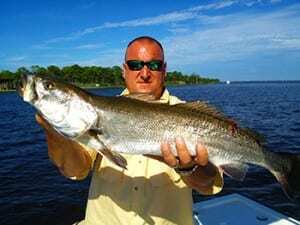 The Redfish are eating the same live baits such as cigar minnows, pinfish and finger mullet. As a Destin Inshore Bay Charter Fishing Guide, I prefer to sight fish these large Bull Reds with artificial baits such as a half ounce jig head with a grub body or any of the topwater lures, which will utimately entice these Bull Reds to come out of the water to enhale your lure. On my Destin Inshore Bay and Flats Charter Fishing trips my clients have knocked down some respectable redfish on Topwater lures. What a Thrill! I just can’t get use to watching this action! While sight-fishing with my clients for Big Bull Reds, the first question I’m asked most frequently, is, “How do I spot the Big Bull Reds?” Great question, because there is a lot of area to cover on the water. But first I look for birds diving. Sometimes, birds will start diving in response to the Bull Redfish chasing and subsequently feeding on bait fish, which have been driven to the surface. The birds such as Pelicans, dive right into the water above the Redfish, snatching an easy meal, and typically identifying the location of the school of Bull Redfish. The other method which I employ to locate Bull Redfish, is to simply drive my boat from its upper helm and simply spot the Bull Redfish school, which will appear as a faint reddish colored blob, which will move rather than being stationary like a bed of seagrass or the like. These are my two main methods for sighting schools of Bull Redfish. Warmer temps sure to make this a Great Sight Fishing Opportunity! The Destin Inshore Bay Shallow Flats are welcoming back the Speckled Trout and Redfish and the Annual Cobia Migration is just weeks away! 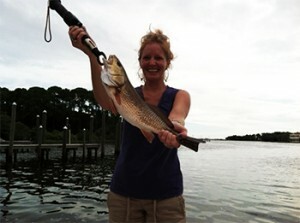 Redfish: The shallow water flats of the Destin Inshore are welcoming back our spotted tailed friends. I Have spotted and caught several slot sized reds while scouting the flats for life. The reds are following the new hatches of bait who will reside in the grass flats throughout the summer. 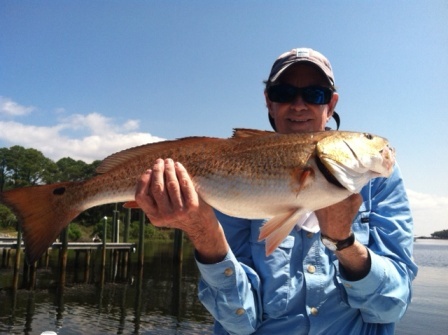 The redfish bite has also been very good with the destin pass being a great place to target these redfish. Look for tide movements because this will typically help congregate these redfish and prompt them to bite. 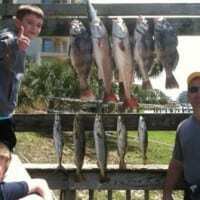 Baits of choice are live croakers, pinfish and large finger mullet. As a Destin Inshore Charter Fishing Guide, clients on my recent trips caught anywhere from 6 thru 20 of these hard fighting redfish. 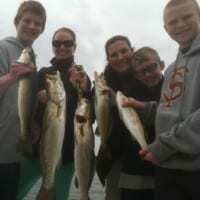 Speckled Trout: Speckled Trout have also started to chew pretty aggressively around the Destin Inshore Bay Flats. Prime Speckled Trout areas seem to be where a freshwater source enters the Destin Inshore Bay and Flats. During early spring, I prefer to throw artificial bait imitations of the surrounding fingerlings that these trout are gorging themselves on. Mirrodine’s in your favorite color seem to elicit quick strikes from these hungry trout. Capt LW Burroughs Awarded the 65th Annual Destin Fishing Rodeo, 2013 Destin Inshore Charter Fishing Captain of the Year and First Place Captain’s King Mackerel Jackpot! The Cooler Water Temps Have Made The Fish Get On The Move In and Around the Destin Inshore! Flounder: The Flounder bite has been exceptional with the cooler water temps. As a Destin Inshore Charter Fishing Guide, I look for at least two good cold fronts to push through the area in November, before I begin to target these fine eating flat fish. The cold fronts send the signal to the flounder that it’s time to move out of the bay. 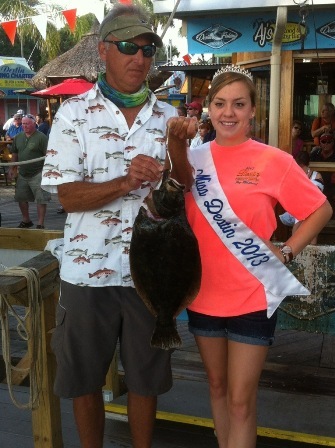 This is absolutely the best time of the year, to get your limit of 10 Flounder per angler. Baits of choice include live finger mullet and bull minnows. My preference for rigging these live baits is either Carolina Rig with a short 8 – 10 inch leader, or a half ounce jig head directly hooked to the live offering. With the Carolina Rig, make sure to allow the flounder enough time to grab your bait and turn it around in his gullet before setting the hook. Sheepshead: The Sheepshead bite has turned on very nicely and as with Destin Inshore Fishing during this time of year, the movement of a couple of cold fronts typically signal these striped bait stealers to make their move toward the Mid-Bay Bridge and Destin Pass area. Baits of choice for these convict fish are live shrimp, fiddler crabs, and raw oyster. A Carolina or Texas rig will serve to help you claim your limit of 15 Sheepshead per angler. 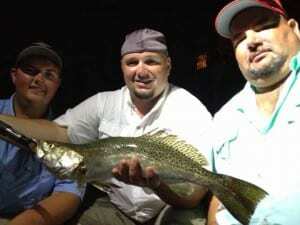 Speckled Trout: The Speckled Trout bite has finally started to slow up a little, however, that simply means you must first take advantage of the sunrise or evening bite. You must also be willing to follow them to their deeper water wintertime hangouts, such as 15 foot plus water depths in muddy bottom bayous and creeks/rivers that feed the bay. Live baits such as live shrimp, finger mullet and pinfish will get the job done. The trout will become a little less active, so be sure to present your baits in a very slow manner. Artificial offerings like lead head jigs with a curly tail grub should be allowed to free fall to the bottom and slowly retrieved. As a Destin Inshore Charter Fishing Guide my first choice for artificial is the curly tail grub in Chartreuse color. The great thing about cold weather trout fishing, is that typically when you locate them, they will be in large groups, so be ready for the frenzy! Redfish: The Reds have maintained their bite consistency throughout the Destin Inshore Bay and Flats. The slot reds have seemed to hold their positions on the Destin Inshore Bay Flats, with several Bull Reds being caught on those same Destin Inshore Flats. However, if Bull Reds are whatcha want, you just can’t beat the Destin Bridge and Destin Pass on an outgoing tide, for Bull reds in the 10 – 40 pound range. The slot redfish are eating the same live baits as the trout, and on some of my Destin Inshore Bay and Flats Charter Fishing trips my clients have knocked down some respectable redfish on Topwater lures. 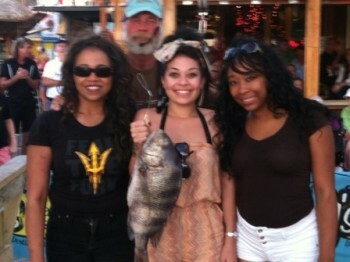 While fishing with my clients for sheepshead, I like to call them in by ringing the dinner bell! Ringing the dinner bell is simply bringing a scraper or flat shovel to chum’em up by scraping the barnacles and oysters the sheepshead like to eat, off of the bridge/dock pylons. When you scrape the pylons, the sheepshead smell the fresh scrapings, and come a running to your area to eat. Once you get them eating, they will recklessly eat your bait without taking anytime to carefully examine it, and at this point just set that hook! The Destin Inshore Fishing has been Phenomenal! 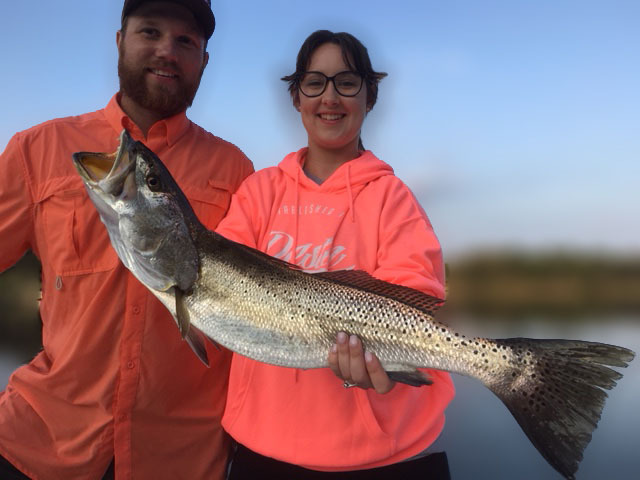 Speckled Trout: The trout bite seems to extend well into the day and the only adjustment needed to prolong your fishing day is to go to the deeper water adjacent to the shallow water Destin Inshore Bay Flats. Baits of choice for these trout are live finger mullet, pinfish and a shrimp under a popping cork. As a Destin Inshore Charter Fishing Guide my first choice for artificial is a topwater offering such as a Top Dog, Skitterwalk or Heddon. 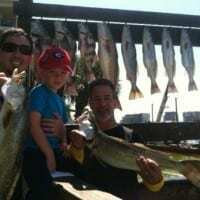 On my recent Destin Inshore Guided Fishing Charters, my biggest dilemma is that my clients catch numerous fish in excess of the one fish over the 20 inch quota imposed by the FWC. However, that’s a problem my clients are gladly willing to deal with. Redfish: The Reds have maintained their bite consistency throughout the Destin Inshore Bay and Flats. The slot reds have seemed to hold their positions on the Destin Inshore Bay Flats, with several Bull Reds being caught on those same Destin Inshore Flats. However, if Bull Reds are your fancy, you just can’t beat the Destin Bridge and Destin Pass on an outgoing tide, for Bull reds in the 10 – 40 pound range. The slot redfish are eating the same live baits as the trout, and on some of my Destin Inshore Bay and Flats Charter Fishing trips my clients have knocked down some respectable redfish on Topwater lures. Flounder: The Flounder bite has been pretty decent in the bay. As a Destin Inshore Fishing Guide, I look for the most snag ridden areas to hunt for these tasty flat fish. Baits of choice include live finger mullet and bull minnows. My preference for rigging these live baits is either Carolina Rig with a short 8 – 10 inch leader, or a half ounce jig head directly hooked to the live offering. With the Carolina Rig, make sure to allow the flounder enough time to grab your bait and turn it around in his gullet before setting the hook. NOTE: THE DESTIN INSHORE FLOUNDER AND SHEEPSHEAD MIGRATION WILL BEGIN IN LATE OCTOBER AND CONTINUE THROUGH MARCH. CATCHING MULTIPLE LIMITS OF THESE GREAT EATING FISH, WILL BE A REALISTIC CATCH EXPECTATION! LOOK FOR MY TIPS AND TRICKS TO CATCHING YOUR LIMIT IN MY UPCOMING NOVEMBER 2013 DESTIN INSHORE BAY AND FLATS FISHING REPORT. While fishing with my clients, I prefer to use live bait. I utilize live bait for my clients, because the live bait typically does all the work. Live bait create pulses and flashes that predator fish key in on, when they are cruising the Destin Inshore Bay and Flats. When the predator fish see your live bait struggling it sends a signal to the predator fish that there is an easy meal waiting. By nature, some of the bigger predator fish are just lazy, and if they can capitalize on an easy meal, they will crush it! With the cooler morning temperatures, the fish have started to bite quite well. Speckled Trout: The crack of dawn and late evening is when you want to start your Destin Inshore Fishing assault on the Speckled Trout. Live baits such as shrimp, pin fish, finger mullet and pogies are baits that will get the job done. Artificial offerings such as the DOA Deadly Assassin under a popping cork with a gold flake shrimp; MirroDine XL, and my Destin Inshore Charter Fishing Guide personal favorite, Rapala Skitterwalk Topwater bait. Most of the trout seem to be in the 17 to 22 inch range. 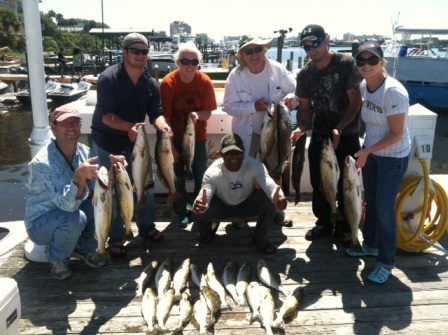 But on most of my Destin Inshore Fishing Charter trips, we have caught some trout in excess of 26 inches. 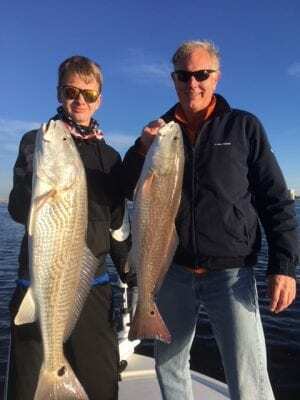 Redfish: The redfish bite continues to be good all throughout the day, Baits of choice for the redfish in and around the Destin Inshore Fishing area are the same as for the speckled trout. In addition, the redfish have really taken well to knocking down the Topwater Baits, producing some impressive blow ups above the waters surface. Be sure to fish the shallow Destin Inshore Flats in early morning hours, and then move to deeper water structure throughout the middle of the day. Flounder: The flounder bite has also been really good. 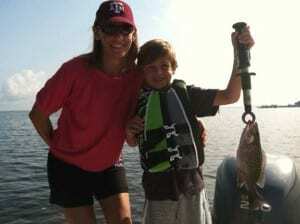 Baits of choice for flounder are bull minnows and finger mullet. As a Destin Inshore Charter Fishing Guide, I like to either setup an 8 inch Carolina rig or attach my live bait directly to a half ounce jig head. As a Destin Inshore Charter Fishing Guide, I depend heavily on tidal movements to determine my fishing strategy. Tides serve to bring small bait fish to the awaiting bigger fish like a conveyor belt. The bigger fish can handle the tide movement a lot better than the smaller bait fish who struggle to swim in the moving tide. This allows the bigger fish an opportunity to eat an easy meal. With August here already, Destin Inshore Bay and Flats Fishing has continued to produce some nice catches of Redfish, Speckled Trout, Black Snapper and Flounder! 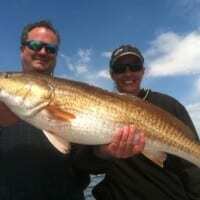 Redfish: The redfish bite has been very good with the destin pass being a great place to target these redfish. Look for tide movements because this will typically help congregate these redfish and prompt them to bite. Baits of choice are live croakers, pinfish and large finger mullet. As a Destin Inshore Charter Fishing Guide, clients on my recent trips caught anywhere from 6 thru 20 of these hard fighting redfish. 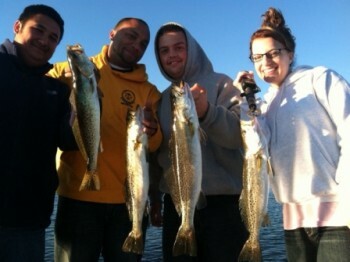 Speckled Trout: The trout bite is pretty good as well, with the best time being at the crack of dawn and late evening. When the water heats up the trout seek refuge in the deeper waters off the grass flats. 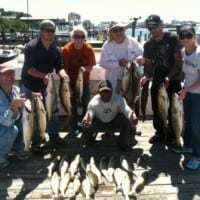 Baits of choice are live shrimp, finger mullet, croakers and menhaden. 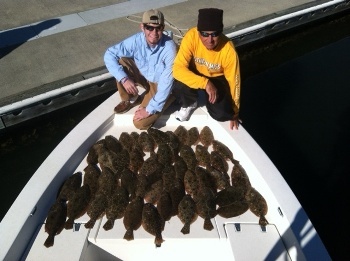 Flounder: The flatties have shown up in the Destin Bay and Flats. As a Destin Inshore Fishing Guide, my clients have actually caught these Destin Inshore Flounder while fishing for back country reds and trout. Baits of choice, are the same as for the Destin Reds and Trout. Any of these baits Carolina or knocker rigged will get the job done. 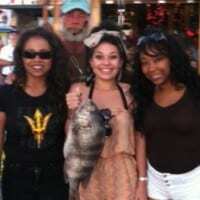 Black Snapper: The Destin Inshore Black Snapper are still consistently biting well. As a Destin Inshore Bay and Flats Charter fishing guide, I have watched my clients literally catch several of these fish and never want to leave. Baits of choice are live shrimp and small pilchards. Look for structure such as bridge and dock pilings in about 5+ feet of water. Be sure to keep those lines tight because these black snapper strike quickly. As a Destin Inshore Charter Fishing Guide, I typically rig up several fishing rods in anticipation of the days catch. With that stated, I also would advise anyone to have a pitch line ready with stouter tackle. During the summer it is a common occurrence to have schools of Jack Crevalle and Tarpon show up on the grass flats while you are fishing for trout and reds. If you have that pitch rod on the ready, you’re sure to be ready for the long drag screaming fights these large fish will produce. C’mon and let’s go catch’em up!